In China you always state your family name first, and then your personal or given name. Our trip leader is Qu (Sally) Yi. Qu (pronounced Choo) means music and is her family name. Yi (pronounced Yee) relates to perseverance and strength and is her given name. 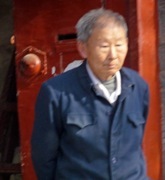 In Beijing we have a local tour leader named Jeung (family name) Feng Li (given name). For the tour, she tells us to call her Jessica. It is Jeung Feng Li's birthday, so we wished her a happy birthday (Chung ee shun ger quai luh). In traditional China you don't get a birthday cake for your birthday. You get a very long noodle (symbolizing long life) and an egg (symbolizing perfection or a perfect place). In China you are considered to be 9 months old when you are born. 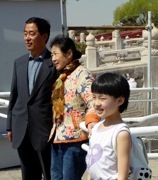 After a briefing by Qu Yi, we set off on a sightseeing tour of Beijing. The word Bei means north, and the word Jing means capital. 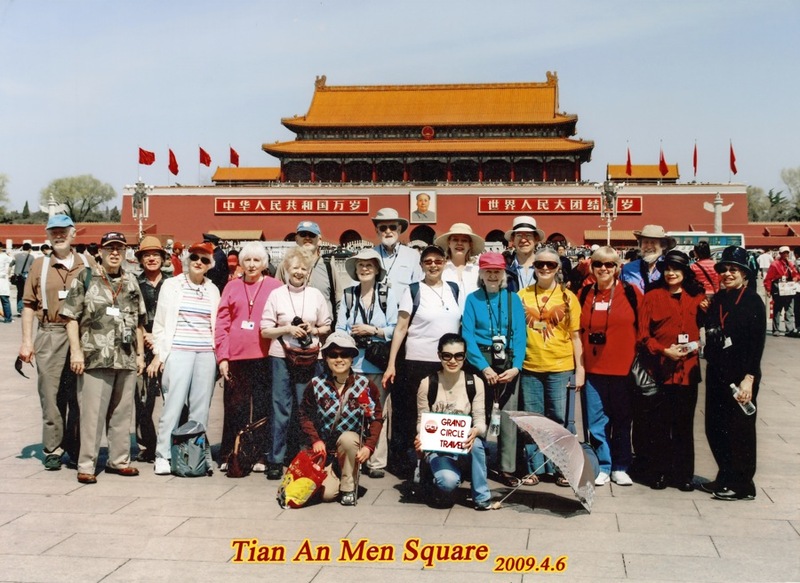 We walked around Tiananmen Square, which has been the setting for most major Chinese celebrations and demonstrations, and was the scene of huge pro-democracy demonstrations in 1989, which were brutally repressed. Beijing is built around Tiananmen Square and the Forbidden City. Beijing is not only the political and administrative center of China, it is also he single greatest repository of monuments and treasures from the imperial era. Beijing was laid out during the rule of the Ming dynasty (1358-1644. In traditional Chinese thought, the world was conceived of as square. A city, especially a capital, was supposed to be square, a geometric reflection of the cosmic order. According to archaeological findings, present-day Beijing is the site of an ancient city that dates to 475-221 BC. Before that, Beijing was half a million years in the making and began with Peking man in Zhoukoudian, hundreds of thousands of years ago. In 1260, Kublai Khan (AD1215-1294) started to change a frontier-trading city into what was to become Beijing. The Ming Dynasty (AD 1368-1644) spent 15 years renovating Beijing as its capital. The rulers of the Qing Dynasty (AD 1644-1911) added to Beijing's charm by constructing several large royal gardens in the city's northwest. Since the founding of the People's Republic in 1949, Beijing has undergone something of a transformation. Beijing's successful bid for the 2008 Olympics in 2001 brings its history up to date. Beijing's registered population is 14.2 million. The floating, or migrant- worker population, is estimated at 4 million. China's 56 ethnic groups are all represented in Beijing; the majority of the city's population are from the Han ethnic group. Beijing isn't just the political and administrative center of China; it also is the single greatest repository of treasures and monuments from China's imperial history. 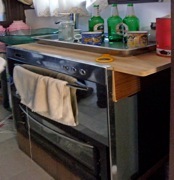 Covering 6,500 sq. 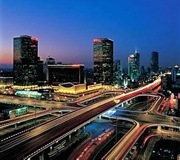 miles, and the home of 14 million people, Beijing is the 3rd largest city in China today (after Chongqing and Shanghai). The discovery of the Peking Man gave evidence that people were living in this area 500,000 years ago. Beijing has served as a main or subsidiary residence of the ruling dynasty of the day since 1000 AD. Under Kublal Khan, in the 13th century, it flourished as the splendid and exotic winter residence of the ruling Mongols. Marco Polo certainly was very impressed with it. The city as we see it today was shaped during the Ming Dynasty (1368-1644 AD). In traditional Chinese thought, the earth was not spherical or even disc-shaped. It was square, and the heavens were round. It is for that reason that the city was structured in a series of concentric squares. Peggy Whigham, Charlie Ohlinger, Martha Luehrmann, Diane Grashoff, Tim Carlenius, Venice Carlenius, and Estelle Scott. Missing are Gene Coupe, Nancy Pollen, and Hazle Jay. Tiananmen Square covers 98 acres. Tiananmen, where emperors issued decrees, and, where Chairman Mao proclaimed that China was the People's Republic of China on October 1, 1949. There was a huge celebration in October of 1999 celebrating the 50th anniversary of the PRO. Tiananmen was the front entrance of the Imperial City of the Ming and Qing Dynasties. In the Ming Dynasty, it was erected in 1417 and first known as Chengtianmen (Gate For Receiving Orders from Heaven or Monarchical Power Coming from Heaven). The gate itself consists of a red platform with five gateways, surmounted by a wooden gate tower. The magnificent gate-tower has a double roof of yellow glazed tiles and vermillion columns. Before and behind the gateways are two pairs of white marble columns. In front of Tiananmen is the Gold Water River with five white marble bridges crossing it. Further ahead in front of the bridges is Tiananmen Square. Tiananmen Gate, also called the “National Gate”, was the gate from which the emperor came in and out when he got married, personally went on an expedition, worshipped heaven at the Temple of Heaven, or attended farming ceremonies at Xiannongtan. It was also used on the grand occasions when the emperor was enthroned, when the empress was set up, and when ceremonies to issue imperial edict were conducted. On October 1, 1949, Chairman Mao Zedong proclaimed the founding of the People's Republic of China from the Tiananmen rostrum. We entered the Forbidden City, so named because it was off-limits to visitors from its start in 1420 to 1920. It was the center of the Imperial palaces for the emperors of the Ming and Qing dynasties. The Qing dynasty ended in 1911, though the last Qing Emperor lived in the Forbidden City until 1925, when it was made into a museum. The Forbidden city contains 800 ceremonial buildings, containing 9,999 rooms (the number 9 was thought to have special meaning as a perfect, imperial, number), and its main courtyard can hold 100,000 people. The Forbidden city is a rectangular block, walled in by a wide moat. The Forbidden City is a perfect example of the concentric-square city-planning concept. Also known as the Imperial Palace, the Palace Museum, or, in Chinese, as the Gu Gong, this was the home and audience hall of the Ming and Qing emperors. 100,000 artisans and 1,000,000 laborers between 1406 and 1420 built the Palace City, during the Ming dynasty. Its grounds cover an area of 178 acres, and it contains 9999 rooms. During the Ming empire, it was the home to approximately 9000 ladies in waiting and 100,00 eunuchs. The Palace City is divided into two major sections; the outer palace, which was used for business, and the inner residential courts. The outer part is mainly composed of three major halls: the Hall of Supreme Harmony, the Hall of Internal Harmony, and the Hall of Preserved Harmony, with another two halls named Wenhua and Wuying on each flank. The red color was used on the gates and outer walls, and the yellow roof tiles was only allowed to be used in imperial buildings. The Hall of Supreme Harmony was where the former emperor held great occasions, while the inner court, where the emperor attended to daily government affairs and where the empresses and the imperial concubines lived, centes around the Palace of Clear Sky, the Hall of Supreme Safety, and the Palace of Peaceful Earth, with six palaces on the sides, the Forbidden City has fourt entrance gates: The main Meridian Gate UWumen) to the south, the Eastern Flower Gate (Donghuamen), the Western Flower Gate (Xihuamen), and the Gate of Divine Prowess (Shenwumen) to the north. The Forbidden City, as its name suggests, used to be strictly off-limits to commoners and foreigners unless they were given special permission. Unauthorized people who ventured into the city were killed. It was not until 1949, that the palace was opened to the public. 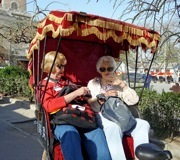 We had lunch at a local restaurant, and the went for a pedicab tour of the Hutongs. Hutongs are ancient city alleys or lanes. In the past, several thousand lanes, alleys, and quadrangles formed residential areas for ordinary people living in the capital. 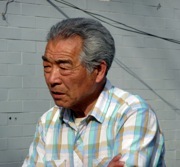 When Arthur visited Beijing in 1978, most Beijingers lived in the Hutong areas. Now most of the Hutongs are giving way to skyscrapers and general urban development, but still, more than 1/3 of the sprawling city area is comprised of Hutongs, and they house about half the Beijing inhabitants. Many Hutongs were built during the Yuan (1206-1341), Ming (1368-1628) and Qing (1644-1911) dynasties. Hutong, means “alley,” and the area gets its name from the narrow lanes created by the high walled residential compounds built one next to the other in these cramped and dense districts. The high walls surround the traditional quadrangle, made up of four single-story low buildings surrounding a courtyard. 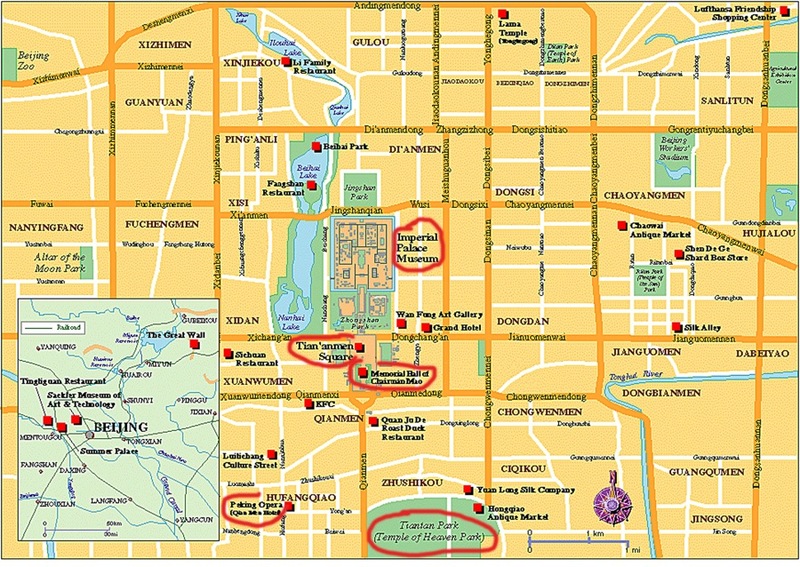 Wealthier Beijinger families might own the entire quadrangle, with relatives in each of the four buildings, and the communal courtyard used for cooking, and eating. 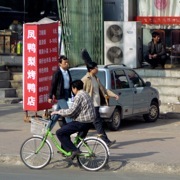 Hutongs take their names from the groups who live within, for instance, the Bowstring Makers' Lane, or if populated by a single family, the family surname. We split up into smaller groups and visited a lady (a retired tour guide) who lived in one of the houses. She supplements her pension by making tourist trinkets, including some glassware where she and a niece paint tiny paintings inside the glass. There we had tea, asked our hostess about her life in the Hutongs, and admired her souvenirs. "Hutong" is a kind of ancient city alley or lane typical in Beijing, where the number of hutongs may run into several thousand. 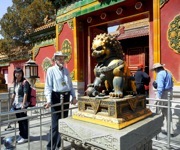 They are around the Forbidden City, many of which were built during the three dynasties of Yuan, Ming, and Qing. At the prime of these dynasties, the emperors, in order to establish supreme power for them, planned the city and arranged the residential areas according to the etiquette system of the Zhou Dynasty. The center of the city of Beijing was the royal palace the Forbidden City. All the main streets were arranged longitudinally and latitudinally. There have been two kinds of hutong. One kind, usually referred to as the regular hutong, was centered closely to the east and west of the palace and arranged in an orderly manner along the streets. Most of the residents who lived in these hutongs were people of imperial kinsmen and aristocrats. Another kind, the simple and rather crude hutong, was mostly located far to the north and south of the palace and housed merchants and other ordinary people. The main buildings in the hutong were almost all "quadrangles" a kind of enclosure of building complex formed by four houses standing on the four sides. The quadrangles varied in size and design with the social status of the residents. The big quadrangles of the highranking officials and wealthy merchants were specially built with roof beams and pillars all beautifully carved and painted, each with a front yard and a back yard. However, the ordinary people's quadrangles were simply built with small gates and low houses. 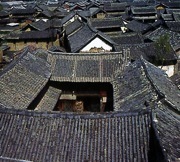 Hutongs, in fact, are passageways formed by many closely arranged quadrangles of different sizes. The specially built quadrangles all face to the south for better lighting, so, as a result, a lot of hutongs run from east to west. Between the big hutongs there have been many small ones going north and south for convenient passage. Therefore, the city of Beijing is like a magnified quadrangle, symmetrically and neatly arranged, and surrounded rectangularly by high walls. 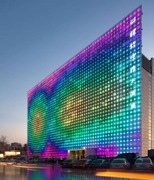 This lends magnificence to the city. By the end of the Qing Dynasty, China was in a backward state of natural economy. People's life was mostly confined to the hutongs and the quadrangle reflected the way of life and social culture at that time. The unified and closed China came under the influence from abroad. A lot of newly formed hutongs with irregular houses appeared outside the city, while many old ones lost their former neat arrangement. 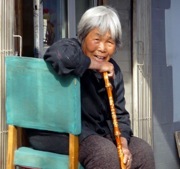 The social status of the residents was also changed and the hutongs were no longer full of life. This was a direct reflection of the collapse of the feudal system. 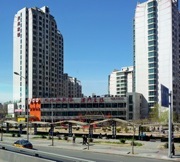 The condition of the city of Beijing suffered deterioration and the condition of the hutongs became even worse. Quadrangles, which used to be owned by one family became a compound occupied by many households. Under the" Great Cultural Revolution" many historical and cultural relics in the hutongs were destroyed. 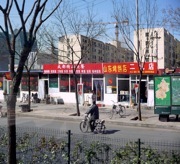 The reform and open policy has brought great changes in Beijing and in many houses in the hutong have been torn down and replaced with modern buildings. 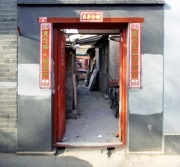 As a result, the hutong today is fading into the shade to the eyes of tourists and inhabitants. 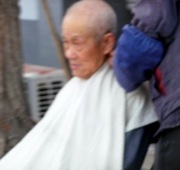 Many hutongs have survived and in this respect, we see the old and the new in Beijing as an ancient, yet modern, city. After our pedicab ride, we had a welcoming Chinese dinner at the Park Plaza Beijing Science Par Hotel, and some of us ordered personal Chops to take home with us.